N8 is an area covering Crouch End and Hornsey. It neighbours on Muswell Hill in the North West, Wood Green from the North, Stroud Green in the South and Harringay in the East. The residents in the age group 29 and younger make up around 30% of the local population. This makes N8 one of the 'older' London postcodes when it comes to the age of it's population. N8 in general is similar in it's character to some of the nicer North and North-West London areas like Highgate or Hampstead. It has a very village-like feel while still being very easily accessible from Central London. In it's level of affluence it is quite similar to the above mentioned areas as well and as such has some famous residents like Boris Johnson or Simon Pegg. N8 is a relatively green postcode even for the standards of North London. 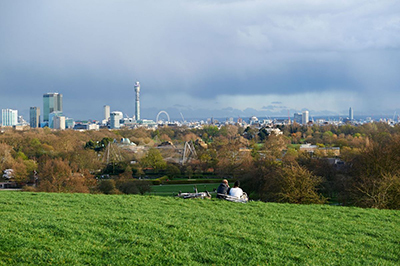 Priory Park, Alexandra Park, Crouch End Playing Fields and Parkland Walk all provide the locals with access to green areas that allow for an escape from living in the one of the busiest cities in the world. Parts of N8 are well connected with buses. Crouch End for example doesn't have a tube station and as such is basically reliant on bus services. Turnpike Lane Station on the Piccadilly line is the only Tube Station in the postcode. Hornsey Railway station also allows travel on the Great Northern Services. Wood Green, Harringay, Crouch Hill and Alexandra Palace are all stations that are within walking distance of the postcode border and as such can be of service to N8 residents. The Northern part of N8 covers Hornsey. You can find many roads completely lined by hundreds of Victorian Terraced houses. This is true specifically North of Priory Road which is a lovely area neighbouring on the southern part of Alexandra Park. You can find a good number of quality schools in this area and Priory Road has many of the of the shops and conveniences that you would expect from a high street in an affluent London neighbourhood. When we move south into the triangle created by Park Road, Church Lane and Priory Road we can find one of the nicer parks in N8. Priory Park is again surrounded by long roads lined by terraced houses in the Victorian Style. This part of N8 is similar in character to the previous area of Hornsey described above with easier access to the amenities of Crouch End. At the southern point of this imaginary triangle you can find the Hornsey Town Hall, Library, The Crouch End Clock Tower and another typical high street situation. The Western part of N8 covers the Crouch End playing fields and Highgate Cricket and Tennis Clubs. It has some of the nicer residences in the postcode and in it's character is very close to it's geographic neighbour in N6 - Highgate. The Eastern part of N8 covers the area around Hornsey Station, Turnpike Lane and Harringay. This is slightly more densely populated area compared to the greener parts of N8. It is still absolutely perfect for leaflet distribution and thanks to it's geographic make-up it is easy to deliver to. N8 in general is going to be an area not to be missed for anyone looking to target North London with leaflet distribution. The many green spaces and beautiful homes attract a more affluent demographic while still keeping all homes easily accessible for our distributors. Only a very small percentage of this postcode is not deliverable or not worth targeting. Tens of thousands of leaflet can be delivered to this area reliably and they will all reach the households they are meant to without an issue. Within our team we also work with some distributors that live locally to enhance our knowledge of the area. This together with the attention to detail that we employ when it comes to deliveries themselves will yield great results for any well planned leaflet distribution campaign. Our distributors make sure to never deliver in the rain to make sure to avoid any water damage to the paper. We also do not fold leaflets into letterboxes unless absolutely necessary. This allows us to deliver your leaflets in the best shape possible. Whether you are a local restaurant, cleaning company, estate agent or a large company looking to enhance their presence in affluent London areas N8 will be a perfect part of the capital to include in your leaflet distribution campaign. Even a postcode like N8 has some parts that if not properly screened can become a waste of leaflets if delivered to. We at The Private Postman make sure to carefully go through each postcode in London and carefully eliminate all business addresses, local authority properties and large apartment buildings that a leaflet distribution company will not be able to gain access to. This allows us to make sure that any delivery made by us includes only the most desirable and responsive properties. Due to this technique we generally tend to have numbers of 10%-30% lower than the official government household numbers in each postcode (the numbers that many companies use). As you can imagine this translates into a 10%-30% saving in printed leaflets and delivery costs for our clients. We can than use these resources in other postcodes or repeated drops and get better results for each and every one of our customers. In your quest of targeting affluent North London areas do not stick only to Hampstead, West Hampstead and Highgate. Make sure to take advantage of the brilliant conditions in N8 as well.